Although 19 countries showed improved terrorism and political violence ratings, the overall data indicates that more awareness is needed for businesses looking to grow. “The global economic crisis, shifting geopolitical balances and two years of unusually high levels of civil upheaval, present challenges and opportunities for businesses looking to expand,” says Henry Wilkinson, head of the intelligence and analysis practice at Risk Advisory. Waning civil unrest associated with financial and economic crises gave Europe the most positive regional outlook, with 47 per cent of nations having lowered risk ratings on last year. In contrast, Asia-Pacific was shown to be the worst affected area, with high-risk countries such as Afghanistan, India, Iraq, Nigeria, Pakistan, Syria, Thailand and the Yemen having a knock-on effect for the region. Julian Taylor, managing director of Aon Risk Solutions’ crisis management and trade credit in Asia, says that businesses throughout Asia have to accept that they are at risk from a broad spectrum of political and social perils, both at home and abroad. 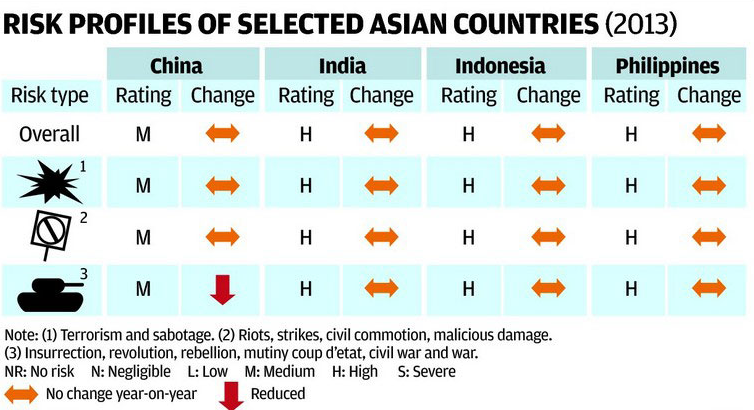 “Almost all countries in Asia have experienced civil unrest in the past 12 months, with China the most protest-affected country in the world, and the likelihood of further unrest around the region in 2013 remaining high,” Taylor says. He adds that economic growth throughout Asia has also meant an increase in overseas investment, often in very high risk parts of the world, where businesses need to take prudent risk management steps to mitigate all risks. Olsen says that, to mitigate these risks, companies need to craft well-thought out crisis management plans, select a good provider of intelligence to prepare emergency strategies and simulate these plans to prepare employees not to panic. Richard Dailly, managing director for Kroll Advisory Solutions in South and Southeast Asia, stresses that companies should do as much homework, and gather as much information as possible on the area they are investing into and the people they are working with. “One needs to be confident that fellow investors and partners are operating in a compliant and ethical manner. These markets are often highly politicised, so we would recommend not only a detailed understanding of the macro politics of a region, but also delving into local detail. Investors need to know about land rights, movement of people, the local environment and working conditions. Failure to have a handle on these issues can lead to huge reputational and legal problems that can dramatically affect the value of a business,” Dailly says. Yoel Sano, head of global political and security risk at Business Monitor International, believes that companies should distribute their investment across key countries, and he thinks that a range of insurance policies are integral to effective risk management. Closer to home, Aon’s Terrorism and Political Violence Map rated political risk levels on mainland China as moderate, with a civil unrest peril for Hong Kong, over potential disruption caused by protests. “We are of the opinion that as the decade goes on, there is the distinct possibility of major social unrest if political changes do not occur in the way certain sectors want. Hong Kong is not a perfect safe-haven and, like every other city in the world, there are issues and the possibility of social unrest,” Olsen says. Aside from the obvious political and social risks, there is also the systemic risks from the banking industry in both China and Hong Kong. He adds that while Asian economies “are somewhat insulated from a similar degree of risk”, the drop in exports due to falling demand from the US and Europe “leaves some Asian countries susceptible to residual political risks”. “Specifically, banking sector weakness and foreign exchange risk in Vietnam, political instability and political violence in Thailand, and social inequality in Malaysia and Indonesia,” Johnstone says. He also points out that social unrest, mass demonstrations and widespread political violence can be triggered by government decision to slash subsidies for essential commodities such as food, petrol and power. Johnstone cites the food price riots in Malaysia in 2011 and in 2007-2008. “The ruling coalition was nearly ousted by voters who cited food and fuel price increases as their main concerns,” he says.